This is exciting: Now that prayer movement is spreading throughout Denmark, as 1,300 people of all ages met earlier this month for the annual meeting of the Indre Mission renewal movement. At the close of their meeting, they banded together in small groups to pray for the entire country. In typical Danish fashion, the prayer time featured “Pray for Djursland” prayer candles, as reminders to remain faithful and keep praying for their land. As Jensen shared examples of how God has answered prayer in individual lives during the past year, he explained how prayer itself is a sign of God’s work. 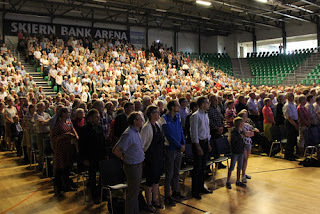 PRAY that the fire of revival will light from these prayers, spreading throughout Denmark in a powerful new way. PRAY for these faithful believers, concerned for their country and for the salvation of their neighbors, that they would boldly and compassionately share the light of Christ. PRAY that many Danes would come to know the Light of the world, Jesus himself, in coming weeks, as a result of these prayers.